Disclaimer: I was provided with a pair of glasses from polette, in exchange for my honest opinion. Your views may differ from mine. Thank you! 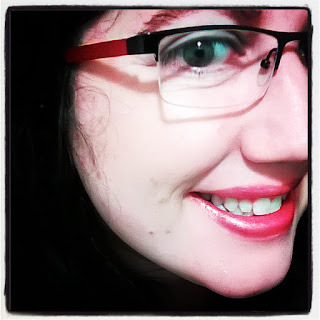 I have needed a new pair of glasses for a while now and I was lucky enough to get the chance to try a pair from polette.com's range of prescription glasses just this week! I picked up my script from the optician and took a long look around at polette before settling on these adorable half-framed red and black glasses, which come with a super thin lens and coating. I waited for the glasses to arrive and it took about 10 business days, which is about as fast as you would get from the eye-doctor that you would normally go to, and yet these were a fraction of the cost if you are to buy them and just as good, if not BETTER quality than you might anticipate. My old glasses were bought on my insurance, I had to spend some cash, they were alright and they did the trick, but..they were not long-lasting, the lenses were thick and bulky looking and the lenses were scratched up and useless fairly quickly. To make it worse, there was not that much of a choice in the place I went to get them, and I didn't feel like paying any more money out of pocket for new ones! 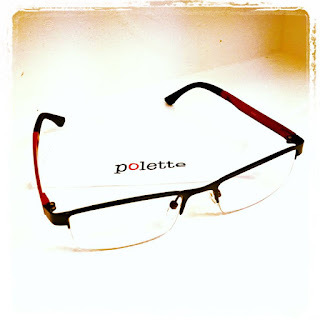 When the polette eyeglasses came along, I loved them immediately! One thing that really struck me was how light they were/are! They are just wonderfully light and airy on my face and I do not feel as though they are there! The lightness is partly due to the half-framed lenses and the thin lenses themselves and when all put together, these scream stylish and modern with function and reliability. Polette outdid themselves, for sure, with these! They fit well, and feel good, and I am also very happy with the service I received and the kindness in the people I spoke to in order to make these happen! I would absolutely recommend these glasses, and know that I will probably never feel the need to walk into an opticians for frames ever again - just the eye exam, thank you very much!! Take a look over at polette.com and see if any take your fancy, and then grab on to those prescriptions and make your face happy! You can check out polette on Twitter and Facebook, respectively! I am adding these to my Holiday Gift Guide list because glasses are a great way to gift someone something affordable AND stylish without breaking the bank!